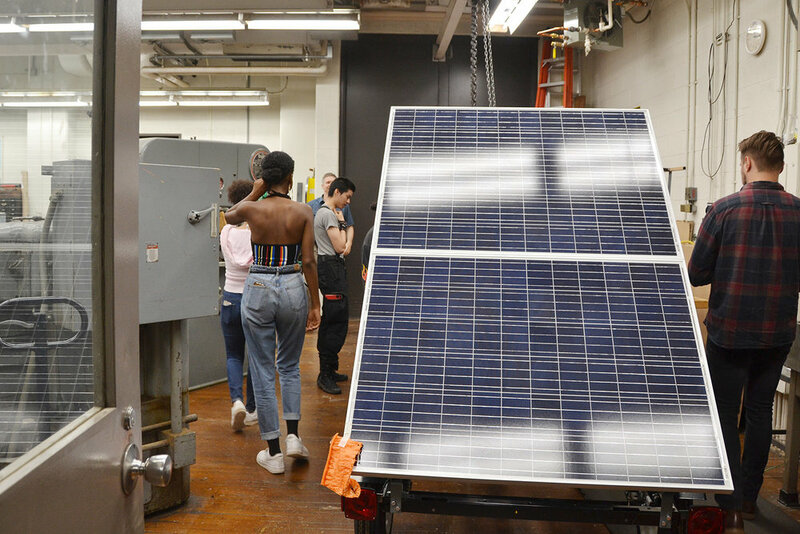 Solar Rover: Wesleyan students, faculty, and staff worked collaboratively to build a solar-powered roving generator, a sustainable alternative to non-renewable generators! Edgar Beckham: The Edgar Beckham Helping Hands Awards honors students' commitment to social justice, one of which is the Excellence in Environmental Justice Initiatives Award. The Green Fund provided funds so that the event could rent reusable silverware and china, rather than using disposable alternatives. Vegan Cooking Series: Community Engagement House and Earth House co-hosted an informative vegan baking workshop, aimed at demonstrating that vegan baking can be simple and delicious. Senior Thesis Greenhouse Project: The Green Fund helped Katherine Paterson '18 construct a greenhouse as part of her honors thesis, which sought to connect urban farming, communal activity, and theater. The greenhouse involved the wider campus community through collective construction, seeding, and tending of the greenhouse. Espwesso Ceramic Mugs: Espwesso, Wesleyan's student-run café, partnered with local artists to develop a sit-down coffee culture by using handmade ceramic mugs. Intercut Magazine: Intercut Magazine is Wesleyan's only film publication. It aims to provide a platform for students to write about film outside the classroom. In collaboration with the SBC, we funded a percentage of the printing costs on sustainable paper from Paladin. Wild Wes Summer Internships: We funded the cost of summer interns to continue work on WILD Wes, a project aimed at transforming the WestCo courtyard by reviving the land that had been facing sustainability problems and creating a long-lasting intelligent landscaping design system. Water Warriors: Alongside The College of the Environment, VEG OUT, the Green Fund co-sponsored the screening of “Water Warriors”, a film detailing a community’s successful fight to protect their water from the oil and natural gas industry. The film was followed by a question and answer session led by the film’s director and featured a day-long exhibition of environmental art. Composting Lesson: In collaboration with Wesleyan Eco Facilitators and Pumpkin Fest, Wesleyan students taught a series of lessons on composting to local Middletown elementary school children. 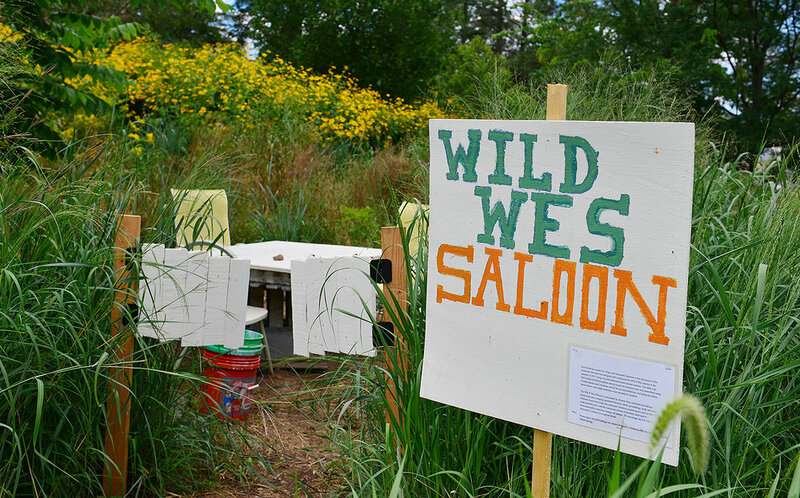 Supplies for WILD Wes: WILD Wes, Wesleyan’s permaculture site, was funded to redesign portions of the garden in response to major erosion. The Green Fund provided supplies that were used to incorporate new plants into the site and repair erosion damage. The Ankh’s spring publication: Funded the difference to sustainably print the spring 2017 edition of Wesleyan's student of color publication. Wesleyan Refugee Project Exhibition: We funded a pop-up exhibit in the CFA called "Stronger Shines the Light," which follows the stories of resettled refugees in Idaho. Middletown Area Transit Signs: We funded signs to be hung on signs outside of WesShop and Fisk Hall for a project taken on by Alex Garcia who is trying to promote equitable transportation for students at Wesleyan by integrating the Middletown Area Transit with the Wesleyan community. Symbolizing the West Bank Barrier: Students for Justice in Palestine constructed an annual “wall” installation, central to generating discussion about the Palestinian struggle on campus. The wall highlighted water issues in Gaza, adding an environmental perspective and previewing planned campus discussions about how water rights are related to settler colonialism. Scott Beibin Groucho Fractal Show: Scott Beibin's eco stage show-- a bicycle-powered show -- is a cross between Bill Nye and Whose Line is it Anyway. It features a home-built 3D printer that prints vegan snacks for the audience. The aim is expose students to the vanguard of citizen science/ independent science research communities and to encryption and cyber security. The show features wearable technologies, like a gauntlet with screen and keyboard that controls projections. Beibin is a citizen scientist, hacker, and conceptual artist. Connecticut Campus Sustainability Conference: Provided the honorarium for guest speaker Gina McCarthy, environmental health and air quality expert, and former administrator for the United States Environmental Protection Agency (EPA). Sistah Vegan Talk & Dinner: Veg Out and the Women of Color Collective invited Dr. A. Breeze Harper, author of Sistah Vegan: Black Female Vegans Speak on Food, Identity, Healthy, and Society, to speak about the intersections between identity and food alongside a vegan meal. WildWES Summer Internships: The Green Fund provided funds for summer interns for the student group "WildWES" which maintains naturalized spaces on Wesleyan's campus including the WestCo and Butterfields Courtyards. Wesleyan Refugee Project’s Syrian Refugee Crisis Teach-in: Katty Alhayek and Basileus Zeno led a teach-in about the causes and consequences of the Syrian refugee crisis. It was specifically focused on the destruction of the environment in the Middle East, the gender dimensions of the refugee crisis and the disproportionate impact foreign military initiatives have on land. SOC Fashion Show Costume Design: Funded costumes which each represented a natural disaster to talk about how people of lower socioeconomic status are predisposed to the effects of the natural disasters and often have the hardest time recovering from them. This project worked on target the SOC community on campus in a manner that is very low stakes and is fun for the audience. This makes this sector more engaging and also less intimidating. We hope for this event to be a part of changing the culture of environmentalism on campus. Cupanion Pilot Program: Worked with Office of Sustainability and Eco-Facilitators to launch a trial period for new reusable mugs that could be distributed to next year’s incoming freshmen and reduce the amount of disposable cups used on campus. The Ankh’s fall publication: Funded the difference to sustainably print the fall 2016 edition of Wesleyan's student of color publication. Chief Arvol Looking Horse: Chief Arvol Looking Horse spoke in a fully packed room at the Daniel Family Commons about his experiences at the #NODAPL protests as well as a spiritual leader of the Lakota Nation. His talk was entitled Global Healing and Environmentalism. Trip to Standing Rock: Under exceptionally urgent circumstances, a group of Wesleyan students travelled to Standing Rock to partake in the #NoDAPL resistance against a colonial pipeline project. Students also created a film using clips from the camp, various protests, and other locations. Bike Co-Op Bike Rental: Subsidized bike rental fees so that bikes were free to rent for the semester. Promoting bike transport introduces green travel and alternative methods of "getting around" to the first years who haven't been exposed to WesBikes and encourages conversation about travel and carbon footprint on campus through the bike program. Food Justice Feed: Communal meal to raise awareness of campus sustainability groups and discussion about food systems with Professor Kathryn Gillespie. Letter Writing Campaign: Funded materials for Wesleyan Climate Ambassadors’ campaign to write to senators about Standing Rock, the Keystone Pipeline, and other environmentally-related events. Out House’s Annual Fall Fest: Funded advertisement-related materials for Fall Fest, an annual event to celebrate the season and generate awareness of the Outing Club community and resources. Long Lane Farm Capital Projects: (Drip Tape) Funded the purchase of a drip tape irrigation system in order to increase efficiency while irrigating fields during periods of high heat and low rainfall. (Summer Interns) Provided funds for four students to work full-time at the Long Lane Farm. Wishing Well Water Stations for WesRAVE: WesRave, the yearly silent rave, was able to provide an environmentally friendly water fountain and biodegradable cups for thirsty participants to use. Etiquette Luncheon: This luncheon, hosted by Invisible Men, Ujamaa, My Brother’s Keeper, and My Sister’s Keeper, brought together Wesleyan students and Middletown high school students to discuss table etiquette and issues surrounding food justice and sustainability. Radical Inhabitation: A collective action to unite Wesleyan students and explore our relationship to green spaces on campus through a workshop, overnight camp-out, and a culminating human banner. Real Food Challenge (RFC)/Local Food Co-op Program with Mcdounagh Elementary: A pilot program to extend the local co-op to the Macdonough Elementary School through Middletown Urban Gardens. Co-op shares are made available to the families of the 30 students in the garden club and given out in conjunction with cooking classes and education about sustainable food systems. Sustainability Education Workshop for Professors: Helped fund the development of a program to encourage the integration of sustainability and sustainability-focused modules into existing courses by facilitating workshops allowing professors to understand how best to incorporate ideas about sustainability into all kinds of classes and learning environments. Alternative Week of Learning (Chocolatada): A week of seminars and workshops focused on labor systems, radical publishing, and sustainable food production, facilitated by guest professors from México. Ecofeminism, Eco-Grief, and Climate Justice Workshop: A conversation with Dr. Heidi Hutner, Associate Dean and Director of Sustainability Studies at Stony Brook University, about ecofeminism, eco-grief, and climate justice. Dr. Hutner addressed the dangerous Algonquin Pipeline and Indian Point power plant, as well as nuclear issues, fracking, and climate justice at large. She also facilitated a workshop in which students discussed their own activism and community-building at Wesleyan. DarkMatter Poetry: The Green Fund helped bring DarkMatter, performance art duo consisting of Alok Vaid-Menon and Janani Balasubramanian, to Wes where they performed spoken word and comedic skit pieces about gender, race, class, sexuality, etc. The Ankh's Spring publication: Funded the difference to sustainably print the spring 2016 edition of Wesleyan's student of color publication. Veg Out "Overthrow the Food Regime" Zine: A zine published by the student group "Veg Out" detailing the environmental tolls, risks and challenges of consuming large quantities of meat as well as including guides and instructions for preparing simple vegan meals and various vegetables. Wes For Peace: A group of 17 students attended the Friends Committee on National Legislation's Spring Lobby Weekend thanks to funding from the Green Fund. Students received intensive lobby training from experienced lobbyists and congressional staffers, and put these skills into practice through lobbying around the issue of mass incarceration. Upon returning to campus, students will hold two workshops for the broader activist and the sustainability activist communities at Wesleyan, in which they will impart what they learned about effective lobbying and mediation tactics from the weekend. Shower Timer Program: A pilot program to install shower timers in Wesleyan dorms to promote water conservation and consciousnes. Fossil Fuel Divest: Funded informative literature to advertise education on environmental racism and climate colonialism using environmentally sustainable ink and recyclable paper. Edgar Beckham Environmental Justice Award: Subsidized the establishment of an environmental justice award for the Edgar Beckham Helping Hand Award. Long Lane Farm Greenhouse: Funded a green house to increase the growing season of Long Lane Farm's farms crops and decrease the farm's dependence on heated spaces for seedlings early in the growing season. Climbing initiative: Gear and certifications to expose a broader Wesleyan community to climbing and the outdoors through "retreats"